Peridot joining the Crystal Gems in Steven Universe has given us some great moments, and a softening of one of the show’s few villains. But while “It Could’ve Been Great” took us to the far flung reaches of the moon, it also showed us that Peridot still has a long way to go on her path to redemption. 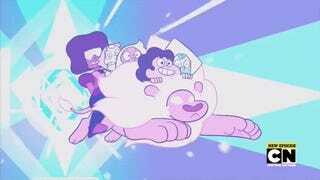 So far, a lot of this week’s run of Steven Universe episodes have been about acknowledging the growth that the cast has gone through over the course of the show’s life—Garnet flourishing from distant enigma to a warm, layered character, Steven’s own physical and emotional growth, and now we turn to Peridot, a recent convert to the side of the Crystal Gems. 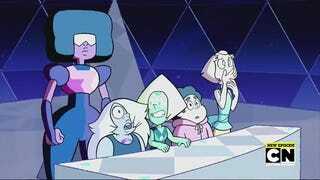 But while she has come on bounds from her days of maniacal cackling as the show’s only real reoccurring villain, this episode really highlighted what keeps her at odds with Steven and the Crystal Gems in a fascinating way. What holds back Peridot is desperate yearning for order and control, for things tangible and intangible to have structure and to have a sense of purpose as part of a greater whole—while the Crystal Gems value the beauty and chaotic sense of freedom that life on Earth symbolizes. We see it in the episode’s delightful earworm of an opening musical number, which starts with Steven teaching Peridot to understand and appreciate the structure and point of music, even if to her it initially looks like a basic form that doesn’t do anything. It’s horror, disgust, fear—everything that they have ever fought for, wiped away in the blink of an eye. The fact that Peridot can’t see that means not just that she’s got a long way to go before she really feels like part of this team, but also that there’s going to be some serious head-butting to come in the near future.